Mia’s grandmother, her Abuela, has come to live with her family. But Abuela doesn’t speak English and Mia doesn’t speak Spanish. But little by little, they learn to communicate, and some of the help comes from a parrot named Mango, who learns both languages as well. This is simply a lovely cross-cultural story. It does address that it’s difficult to learn a new language, and takes lots of practice, but all the motivation in this story is love. 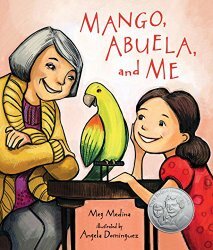 The first night, before Abuela goes to sleep, she shows Mia a red feather from a parrot that nested in her mango trees back in her old home. This is the episode that gives Mia the idea to purchase the parrot in the pet store for Abuela and name him Mango. Spanish words are peppered throughout the story. It’s just a nice twist on the stranger-in-a-new-country story. This time it’s not the girl herself, but her Abuela who clearly loves her and learns to tell her stories about her Abuelo, and also learns to hear all the stories Mia has to tell. Henry Holt and Company, New York, 2010. 343 pages. I finally read this book as part of my Award Challenge — reading award winners and honor books — and because I have an Advance Reader Copy of its sequel, Necromancing the Stone. This isn’t necessarily a book I would have read otherwise, since it is quite dark, with a grisly death and necromancers and a werewolf clan. However, once I got through the rather gruesome beginning, I found myself liking the characters and the light-hearted, humorous approach to this darkness. Sam is a college drop-out working in a fast food joint, without a lot of prospects. He’s definitely surprised when he gets the attention of a seriously mean and scary man whose tail light he happened to break when playing potato hockey. When someone frighteningly strong beats him up after work and his friend’s head is sent to him in a box, well, he figures he can’t exactly ignore the problem. He’s told he’s a necromancer, able to communicate with the dead. But why didn’t he know about it until now? And what does it have to do with the herbs his mother gave him to wear around his neck — the herbs that keep away nightmares? It turns out that the necromancer who spotted him has plans for Sam that won’t be good for him. He’s also hiding a beautiful teenage werewolf in his basement. Sam needs to get enough information about who this necromancer is to be able to do something to stop him from killing Sam and stealing his power. This is a surprisingly fun book about a good — but perhaps a bit irresponsible — kid thrown into some dark situations. Sam deals with them with humor and flair. I opened the box, then quickly dropped it and scrambled up onto the counter, making very dignified shrieking noises. Ramon stared. Frank came into the kitchen just in time to see the box bounce onto its side and its contents roll lazily out. Ramon tried to back up, but he was already against the wall. Frank managed a quick hop back as Brooke’s head rolled to a stop in the middle of the floor. It had already been severed cleanly at the neck, making her ponytail appear longer as it trailed behind like the tail on a grotesque comet. I couldn’t see any blood. In fact, the wound looked cauterized, which didn’t make it any more pleasant. I screamed and grabbed a butter knife off the counter. I’m not sure what I planned to do with it, but in the meantime I held it in front of me just in case Brooke suddenly grew her body back and attacked. I mean, if she could talk, what was stopping her from leaping up and gnawing piranha-style on my ankels? Once a severed head talks, life’s possibilities seem endless. Frank ran and hid in, I think, the bathroom. I heard some crashing noises that sounded like stuff being knocked around in my shower, anyway. Ramon slid behind the easy chair and hugged it, keeping his eyes on the head at all times. I think he’d stopped breathing. I crouched there, unmoving except for the shaking of my brandished butter knife, and stared at the head of a cute girl resting in the middle of the dirty linoleum of my kitchen floor. For some reason, I had the irrational thought of asking Mrs. Winalski whether or not this counted as having a girl in my apartment. Little Brown and Company, New York, 2011. 354 pages. I read this book as part of my crazy plan to read award winners, even though I know it’s impossible, so I began by focusing on award winners where I’ve actually met the author. I started this book the evening after I got home from ALA Annual Conference, and stayed in bed late on Independence Day morning to finish it. The book is absorbing, quick reading, but very insightful. Now I have to say to start off with: Call me old-fashioned, call me a prude, but I’m really glad that back when I was dating, we didn’t get naked with a guy on the 2nd date or so. We didn’t expect a kiss to mean we’re going to be felt up right away. And on top of that, I’m really happy that I didn’t have to plan when and where to lose my virginity. Or, wait a minute, I did plan a big party with all my family and friends (a wedding) and I lost my virginity in a truly extraordinary place (a honeymoon). Makes me feel sorry for kids today missing out on that. In a sec you’ll hear a thunk. At your front door, the one nobody uses. It’ll rattle the hinges a bit when it lands, because it’s so weighty and important, a little jangle along with the thunk, and Joan will look up from whatever she’s cooking. She will look down in her saucepan, worried that if she goes to see what it is it’ll boil over. I can see her frown in the reflection of the bubbly sauce or whatnot. But she’ll go, she’ll go and see. You won’t, Ed. You wouldn’t. You’re upstairs probably, sweaty and alone. You should be taking a shower, but you’re heartbroken on the bed, I hope, so it’s your sister, Joan, who will open the door even though the thunk’s for you. You won’t even know or hear what’s being dumped at your door. You won’t even know why it happened. It’s a beautiful day, sunny and whatnot. The sort of day when you think everything will be all right, etc. Not the right day for this, not for us, who went out when it rains, from October 5 until November 12. But it’s December now, and the sky is bright, and it’s clear to me. I’m telling you why we broke up, Ed. I’m writing it in this letter, the whole truth of why it happened. And the truth is that I goddamn loved you so much. The thunk is the box, Ed. This is what I am leaving you. . . . Every last souvenir of the love we had, the prizes and the debris of this relationship, like the glitter in the gutter when the parade has passed, all the everything and whatnot kicked to the curb. I’m dumping the whole box back into your life, Ed, every item of you and me. I’m dumping this box on your porch, Ed, but it is you, Ed, who is getting dumped. The thunk, I admit it, will make me smile. A rare thing lately. . . . The world is right again, is the smile. I loved you and now here’s back your stuff, out of my life like you belong, is the smile. I know you can’t see it, not you, Ed, but maybe if I tell you the whole plot you’ll understand it this once, because even now I want you to see it. I don’t love you anymore, of course I don’t, but still there’s something I can show you. You know I want to be a director, but you could never truly see the movies in my head and that, Ed, is why we broke up. And so Min gives Ed a box full of stuff. The box and each item in it is pictured one by one, as Min tells the story of their relationship. It wasn’t a long relationship, lasting from October 5 to November 12. But Min has quite a number of souvenirs and you can see from the excerpt above how good she is at spinning words, showing you pictures. And, I have to say this also, the book has a universal feel to it. On the back, it says, “Min and Ed’s story of Heartbreak may remind you of your own.” There are quotes from other writers about high school heartbreak. I realized that though I had my heart broken not long ago, though I did get a divorce, I never did really break up. Instead, I got secretly betrayed and abandoned, while I was trying to cling by my fingernails to the marriage. Funny how reading someone else’s story, it’s easy to see what a good thing it was for Min to break up with Ed. Easy to imagine the satisfaction that Thunk must have brought. I got to thinking, what would I put in a box if I were to really act out a break up with a Thunk? What would I write in a letter? Now, mind you, there’s no box big enough for 24 years of marriage, and no book long enough. But Why We Broke Up did spark some deep thinking. I decided to celebrate Independence Day by putting away my wedding pictures. (Yes, I admit, I still had them up.) So not only was it a tremendously engaging story, it was therapeutic, too. And that’s a win all the way around. Since he was seven years old, Lucky Linderman has dreamed about his grandfather, who was Missing in Action in Vietnam so many years ago that Lucky’s father never had his father around. These dreams are dream-like, with dream-like impossible things happening in them. But when Lucky wakes up, he has things in his hand that he was holding during the dream. His grandfather gives him a cigar, for example, and he’s holding it when he wakes up. If he steps in mud, he’s dirty when he wakes up. This was a common conversation topic between Nader (shotgun in the mouth), Danny (jump in front of a speeding truck) and me (inhaling car fumes), and we’d been joking about it for months during seventh-period study hall. I never saw anything bad in it. That kind of stuff made Nader laugh. And Nader laughing at my jokes meant maybe I could get through high school with less shrapnel. I think you can see why this survey led to “concern,” but the fallout also leads to bullying. And he gets some answers to his survey from surprising places. As the book continues, Lucky deals with more bullying and a trip with his Mom to Arizona to stay with his mother’s brother and wife, crazy Aunt Jodi. All the while, he’s dealing with these dreams that are somehow real. And the ants? Well, the ants are a sort of Greek chorus that Lucky sees, who watch and comment on his every move. Ants appear on the concrete in front of me. Dancing ants. Smiling ants. Ants having a party. One tells me to hang on. Don’t worry, kid! he says, holding up a martini glass. It’ll be over in a minute! All of this may sound strange, and it is. The book is strange, and the phenomena are never explained. But somehow it all adds up to a powerful and moving story about a boy growing up and learning to face tough things. By the end of the book, you’re completely on the side of Lucky Linderman, and confident that he’s going to make it through high school. Source: This review is based on an Advance Reader Copy I got at an ALA conference and checked against a library book from Fairfax County Public Library. 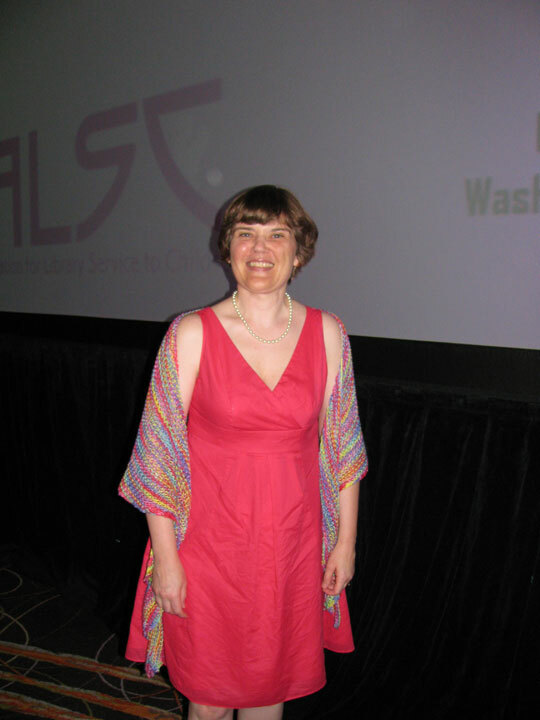 I had such a wonderful time at the 2012 Morris Seminar, learning how to participate in Book Evaluation Committees, I’ve decided to finally join Capitol Choices. Capitol Choices is a Washington, DC, area group that makes lists every year of Noteworthy Titles for Children and Teens. I decided to join the Ten to Fourteen Reading Group. I think this is a nice transition position to being on an award committee some day. It’s a voluntary group, and I don’t feel obligated to read every single book being considered (though I will definitely try). I’m planning to read more new books in that age group than anything else, but I’m not going to read exclusively from this group. And that brings me back to my Crazy Reading Plan which I posted in January. It’s March 3rd. How am I doing? Put that way, it adds up to 31 books, which is not bad at all for March 3rd. The part I don’t like is that I’ve only gotten through two complete cycles of my Plan. But I am enjoying it. I love that I’m getting around to rereading favorites (so far, all three books were ones I loved and reread before reading a newly published sequel). I love that I’m slowly getting award winners, which I’d been meaning to read, read. I love that I’m reading books I own. I love that I’m getting a few ARCs read before they’re published. In fact, I’ve decided to make the cycle even slower. First, I’ve decided, for awhile anyway, to alternate between books on my plan and books for Capitol Choices, either already on the In Progress List or that I think might be good candidates. That will be my way of compromising between reading more of these books than anything else, but still getting to read adult books. But the other, very silly thing I’m doing is adding Awards to my Award Winners Workbook. When I started my plan, I had lists from six different awards of books I haven’t read that have been honored by those awards. Confession: I had lots of fun making those lists. When I hear about another award for middle grade or YA books, I find myself making another list. SLJsBoB books I haven’t read yet, from the present or past (18 books). Andre Norton Award Winners and Finalists (27 books). 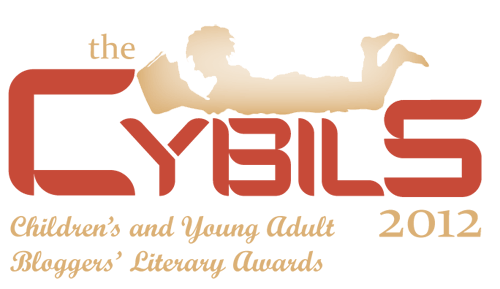 Edgar Award Winners and Finalists for Children’s and Young Adult Books (336 books). LA Times Book Prize Winners and Finalists for Young Adult Literature (19 books). Past Capitol Choices List books for ages ten to fourteen and fourteen and up (hundreds of books). Josette Frank Award Winners (74 books). As you can see, this is getting completely ridiculous! I will be very lucky if I get ONE book read from each award list before the year ends, let alone all the books honored this year. My one hope is that by reading for Capitol Choices, I’ll read most of next year’s award winners before they win, thus meaning my lists won’t grow faster than they get depleted. And there’s something about putting a book on a list that comforts me in the belief that I WILL read it some day. So many books, so little time is the story of my life. This way I can operate in the belief that I’ll get to the truly good books some time or other! And of course the overarching principle is that I love rules and I love reading and I love variety — and I think this Plan is FUN! So onward I go! You are currently browsing the archives for the Award Challenge category.